Dev Update: Revenants, Temporal Rifts, Building Models, Tech Updates and more! It’s been a busy month of work on Predestination! We’ve fixed dozens of bugs and crashes since releasing the tutorial, and have been working hard on our last remaining big features before launch. We’re now at Version 0.9.0.0 and making solid regular progress toward release. This month we developed some big core features like the evil Revenant race, temporal rifts that appear throughout the game and spit out ships, and of course the first release of our building models. We’ve also revamped the Space Exploration era technology trees, added several new ship modules and weapons, implemented warp-capable missiles and customisable probes, and laid the ground work for fully customisable player-designed space stations. Read on for a detailed breakdown of this month’s biggest developments on Predestination. 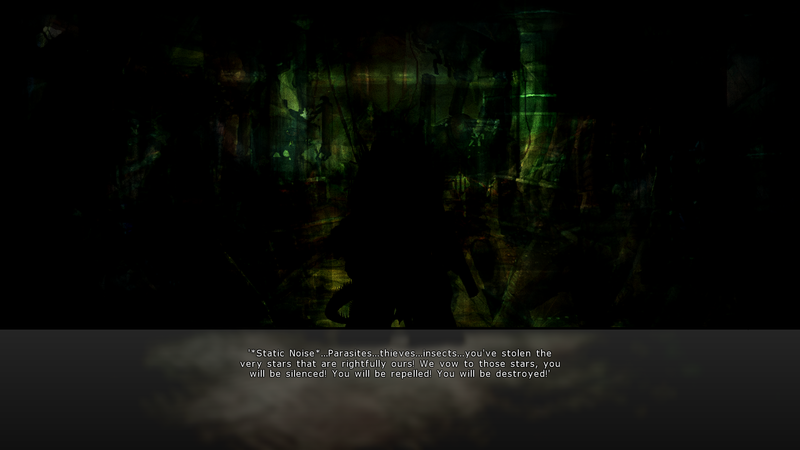 Before I delve into the update I’ll give a quick recap on the the core storyline of Predestination. The story kicks off in the future when humans from the United Colonies of Earth discover a cloaked planet filled with advanced technology. They plunder the planet for its technology and in the process wake its former inhabitants who were in suspended animation underground. This mysterious Revenant race begins sending powerful ships out from its homeworld to systematically wipe out all life in the galaxy, annhilating populated worlds belonging to dozens of space-faring civilisations. The few survivors band together for one final attack on the Revenant homeworld as the United Colonies attempt to use a stolen piece of Revenant technology to freeze the entire solar system in time and end the war, but something goes horribly wrong. Temporal rifts start to open all throughout the star system, pitching ships back through time and scattering them throughout the galaxy. This is where the game officially starts, as you command of one of those ships that has crash-landed on a habitable planet and must work to rebuild your race’s civilisation in the past. The smaller and less advanced ships were sent back further in time, and as a result you were one of the first to emerge. Throughout the game, new temporal rifts will continue to open and deposit more ships, debris, and technology from the battle with the Revenants into your galaxy. If you’re lucky, they will deposit working ships belonging to your race, pieces of advanced technology, or escape pods containing legendary ship captains. If you’re not so lucky, enemy ships could emerge or even a few of the Revenants themselves, who will head to the nearest planet and attack. Rifts will begin to appear in the Space Exploration era and can only be seen when they’re in sensor range of your colonies. If you have the Astonomical Survey technology, you’ll be able to detect a temporal rift a few turns before it opens, giving you the opportunity to send your own ships to investigate. Whoever has ships at a rift when it opens will investigate it abd get all of the rewards from it, but also shoulders all of the risk as enemy ships will engage them. With the Astronomical Research technology, you also get 100 bonus research points for each rift you investigate even if nothing of consequence comes through. This feature has been completed, but has been disabled while we work on an algorithm to balance temporal rift appearance. In our tests, sometimes the Revenants would emerge and attack a player who is already losing, which feels like the game is punishing you. We’d also like to add a few more positive outcomes from investigating rifts other than just the 100 research points from the Astronomical Research technology so that players feel encouraged to explore them. Quantum Inversion Bomb: A powerful Revenant bomb that can be launched against planets in Fleet Combat or used to bomb cities from orbit, dealing 1,000 damage. Quantum Drone Launcher: A remote weapons platform that can launch up to four automated drones in Fleet Combat, each carrying one Particle Beam. The Quantum Drone Launcher generates a new drone once every four turns. Disintegration Pulse: A powerful Revenant weapon that sends out a wave of destruction, causing 100 damage in every hex in a range of 2 hexes. Ships larger than 1 hex can be hit multiple times. Displacement Device: A ship module that takes a ship partially out of phase with normal space, causing 25% of incoming attacks to completely miss the ship or pass through it harmlessly. This miss chance is applied separately to a ship’s dodge chance and works on all forms of attack. This bonus does not stack is multiple devices added a single ship. Damper Field: This ship module produces an energy field around a ship that reduces the energy of incoming attacks by 50%. Damper Fields cannot be applied to ships with shield generators attached. Reflection Field: This ship module uses advanced subspace field harmonics to partially invert incoming beam weapon attacks using the ship’s warp drive, reflecting 25% of the damage back on the attacker. Norn Iron Armour Plating: The most advanced form of armour in the game is Norn Iron, which is ordinary iron that has been constructed on a sub-atomic scale to form a single crystal and has had its electronic properties modified by unknown means. As a result, it repels kinetic and thermal damage more effectively than any known metal or alloy. One of the questions we get asked most frequently is when the building models will be added. We’ve been using coloured hexes (like the one in the center of the screenshot below) as placeholders to represent our buildings for most of development while our 3D modeler and art director have been getting the models made. While we haven’t completed all of the buildings yet, we decided to release those that we’ve already finished in order to collect feedback as early as possible. Some important buildings like the Factory, Metal Silo and Research lab are being finished off as I write this, and we’ll be deploying each new model as it’s finished. We plan to add a small border model around each hex that varies based on the type of building and helps show the areas taken up by large buildings. For example, military buildings may have higher walls with barbed wire while civilian buildings may be surrounded by roads. We’ve also discussed adding ground shadows for each of the buildings, though this is actually a larger technical undertaking and we still have several core gameplay features and user interfaces to finish before we can focus on things like this. With the addition of the new weapons in this patch, we revisited the original design for ground-based weaponry, which had different buildings for each beam weapon or missile type. Upgrading all of your buildings every time you get a new cannon would have been needless busywork, so we’ve now streamlined this system. There’s now just one Ground Cannon building, one Missile Base building, and one Fighter Garrison building. Each one is automatically upgraded to use your best beam weapon or missile when new technology is discovered. 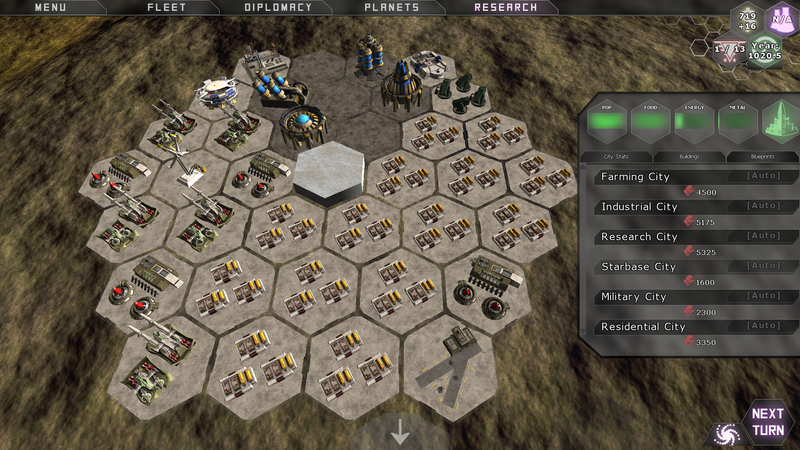 Below is a screnshot of a military city with a Class II City Shield, missile bases, ground cannons, a fighter garrison and a lot of energy batteries to power them all. One of the big tactical weapons we had originally designed for Predestination was a series of warp-capable missiles that can fly to an enemy planet and bombard it if the planet is unprotected. We have now implemented this in a more friendly way by adding the “Warp Missile” hull in the 3D ship designer so that players can now design their own warp-capable missiles. Each missile can carry up to 50MW of weaponry and are limited to using only bombs, and they die immediately on bombing an enemy planet. Warp Missiles cost money and metal to build but don’t take up any command points so there’s no limit to how many you can stockpile. With the Warp Missile Speed technology, they can also be made 50% faster in warp than your normal ships, so they can often strike an undefended planet before the enemy can send ships to defend. Their big weakness is that even a single defending ship will take them out with ease. 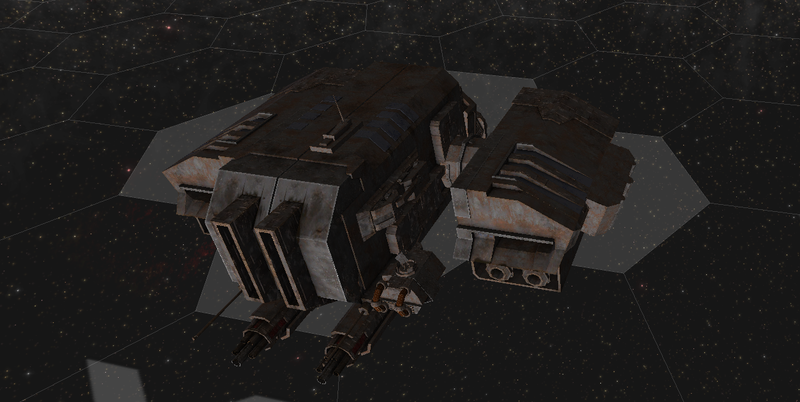 We’ve also added the Probe hull to the ship designer, which lets you customise the appearance of your one-use probes. Right now the only modules that can be used with probes are defensive technologies and the Orbital Scanner, but we may add other probe-compatible technologies in the future. Graviton Beam: The Graviton Beam is a powerful 25MW ship weapon that tears enemy vessels apart with waves of gravimetric energy, dealing 25-50 damage in an extended arc with a range of 5. Graviton Beams have a 10% chance to detonate each unfired enemy missile or bomb instantly for additional damage. Gravimetric Missile: A powerful gravimetric missile that tears enemy ships apart with a wave of compressed gravitons, dealing 50 damage on impact. The Gravimetric Warhead has a 10% chance to detonate each unfired enemy missile or bomb instantly for massive internal damage. Auxiliary Power Core: The Auxiliary Power Core is a ship and starbase module that adds an extra 150MW to the ship’s power grid capacity, allowing it to fit additional weapons and defensive modules. The device is expensive when used on a ship, and unlocks the BattleStation ship design, which has 400MW of your latest defenses and weaponry and provides 2 additional Command Points. Research Bay: A non-combat ship and starbase module that conducts dangerous research in space that can’t be safely conducted within a planetary atmosphere. The bay provides +4 research per turn and consumes 50MW from your ship or space station’s power core. This technology also unlocks the Research Starbase design. 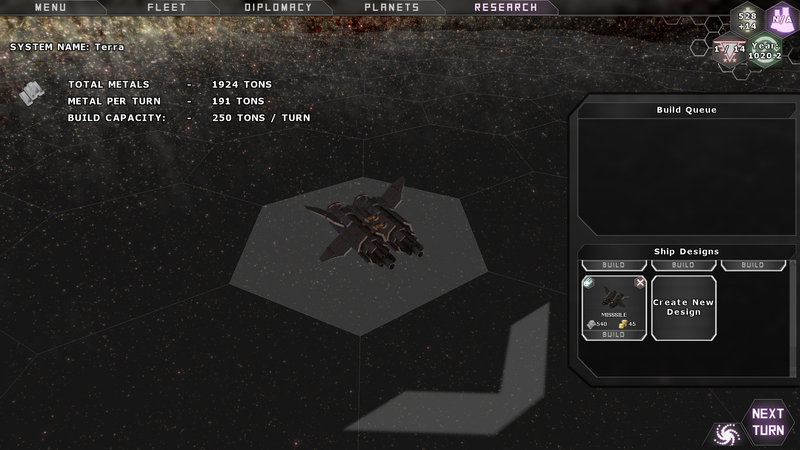 Fighter Bay: A ship and starbase weapon that launches automated fighter drones in Fleet Combat. It can launch one fighter at a time, and prepares another fighter for launch every 4 full combat rounds. Each fighter is equipped with one unit of your best point defense or standard beam weapon. Shield Capacitor: A ship module is a 25MW shunt that feeds extra energy into the shield grid in a controlled manner, increasing the recharge rate of all shields on the ship by an additional 10% of your total shield hitpoints each round. Multiple capacitors will stack additively. Beam Capacitor: A ship module ties all beam weapons into a massive central capacitor, allowing weapons to fire for a longer duration. All beam weapons fired by a ship using this module will have +10% chance of hitting a critical ship system or overloading the enemy shields, dealing double damage. Flak-Cannon Mass Driver: An array of miniature Mass Drivers designed specifically to destroy enemy missiles and fighters. It deals 20-40 damage in a range of 4 and automatically fire one reactive strike per round at any missiles or fighters that enter range, but can’t be fired at enemy ships. The player currently can’t design their own starbases using the 3D ship designer, but we plan to add that capability in the near future. To prepare for this, we’ve revamped the Construction tech tree to replace the specialised Shipyard Starbase, Mining Starbase and Research Starbase with a series of starbase bay modules that can only be added to starbases. 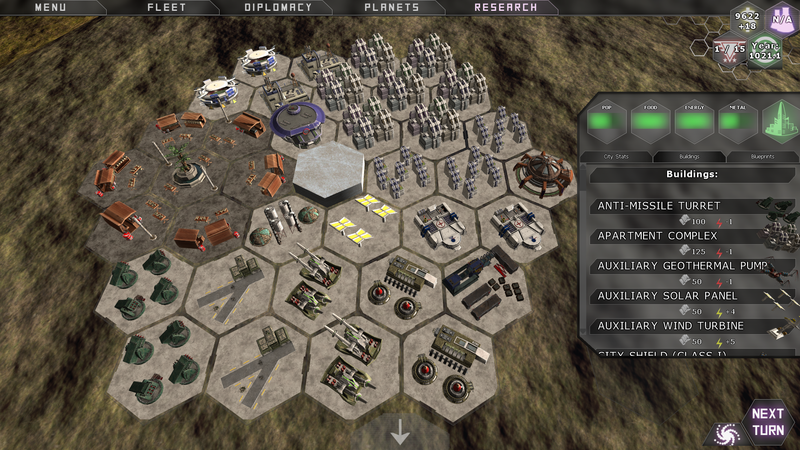 Instead of selecting from a number of pre-designed starbases, you now pick between three different tech paths in the Construction tree that offer different starbase modules specialised for combat, empire-building, or ship manufacturing. Starbase Sensor Array: A starbase module that uplinks with the sensor systems all defending ships in Fleet Combat, providing a +10% bonus to damage from all ships while the starbase is operational. The Fighter Bay: A ship and starbase weapon that launches automated fighter drones in Fleet Combat. It can launch one fighter at a time, and prepares another fighter for launch every 4 full combat rounds. Each fighter is equipped with one unit of your best point defense or standard beam weapon. Orbital Cannon Bay: A starbase module that deploys and controls two small orbital weapons platforms when in Fleet Combat. The weapons platforms are equipped with 50MW of your best beam weapons and defensive modules, and the deployment bay itself consumes a total of only 50MW from the starbase’s power core. Hydroponic Bay: A non-combat starbase module that grows food in a controlled environment in orbit and ships it back to the planet via the starbase’s orbital tether. The bay produces 1000 food per turn regardless of the planet’s environmental conditions and consumes 75MW from your space station’s power core. This technology also unlocks the Food Starbase design. Solar Collector Array: A non-combat starbase module that collects energy from the sun without the diminishing effects of the planet’s atmosphere and transmits it back to the planet through the starbase’s orbital tether. The array produces 100 energy per turn and consumes 50MW from your space station’s power core. This technology also unlocks the Energy Starbase design. Manufacturing Bay: A non-combat starbase module that uses toxic manufacturing techniques that can’t be safely conducted within a planetary atmosphere. The bay increases metal production across a planet by 15% and consumes 150MW from your space station’s power core. This technology also unlocks the Manufacturing Starbase design. Shipyard Extension Bay: A non-combat starbase module that provides additional capacity for ship construction, increasing the shipyard’s build speed by 100 tons of metal per turn and consuming 50MW from your space station’s power core. This technology also unlocks the Shipyard Starbase design, which comes with two of the modules attached. A huge thanks to everyone for reading this month’s big development update, and as usual please do give us your feedback on everything here and feedback from playing Version 0.9.0.0, which is now live on Steam Early Access. We’ve promised to take a few days off over the holidays to relax, but we still plan to release minor patches to add new building models and fix any bugs that pop up. We’ll be keeping a close eye on the crash reports, so please keep sending those in! Development will ramp up yet again as we head into the new year, and 2016 will be the year of Predestination!